Former England paceman Simon Jones has revealed he is playing amateur cricket for Bridgend Town after failing to secure a Twenty20 contract. 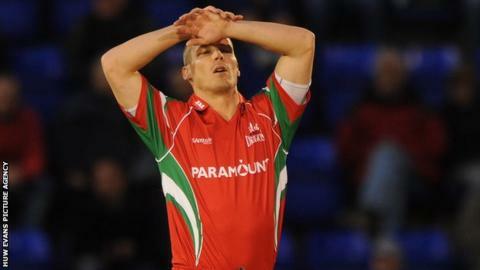 Jones, 35, failed in his bid to get a Twenty20 contract with Glamorgan for the 2014 season. He also missed out on the Indian and Caribbean Premier League auctions but says he still wants to play first-class cricket. "It has been tough, I will be honest with you," said Jones. "You put your hat in the ring with the auctions and unfortunately I didn't get picked up, like many of the lads on the county scene. "I think KP [Kevin Pietersen] was one of the only ones to get picked up in any of the tournaments. "It is one of those things where you would like to get a gig because financially it is great, but the experience is something to get excited about really. "The Caribbean would have been perfect but it didn't happen and I am still carrying on playing my cricket with Bridgend. "I am keeping myself in good nick so if there are any injuries around the County circuit, and if somebody shows interest, that I am ready to go. Jones, who was an England Ashes winner in 2005, helped Glamorgan reach last season's YB40 final at Lord's, where they lost to Nottinghamshire. But Jones played only one match in the shorter T20 format because of injury. Jones announced his retirement from first-class and List A cricket after the YB40 final in 2013 and revealed his intention to concentrate on Twenty20. He is now coaching youngsters, as well as playing amateur cricket with Bridgend Town in the South Wales Premier Cricket League. Jones was part of the Bridgend side which won their opening game of the season against Swansea Cricket Club.